The Point Pleasant wrestling team has begun competition in the AAU Scholastic Duals at Walt Disney World in Orlando, Florida. The competition runs from June 24 through June 28. Standing in the front row, from left, are George Smith, Mitchell Freeman, Christopher Smith, Derek Raike, Isaac Short, Parker Henderson, and MacKandle Freeman. 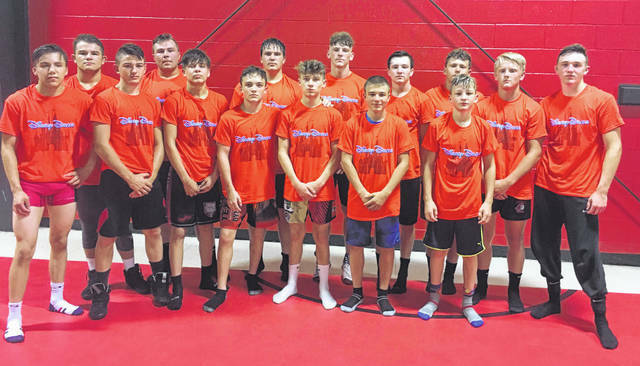 Standing in the back row are Juan Marquez, Nick Ball, Wyatt Stanley, Logan Southall, Riley Oliver, Brayden Connolly, Wyatt Wilson, and Zac Sampson.